Often known as the "School Bus" due to its shape, it is a worthy successor platform for the 203mm B-4 cannon first available on the SU-14-1 and the S-51. Even though it is one tier higher, the SU-14-2 can still utilise the B-4 to deliver more alpha damage than any other SPG of its tier. Relative to its predecessors, it has an improved rate of fire (1.5 times as many shots per minute) and some armour to bounce hastily aimed scout shots. Unfortunately, all this armour comes at the expense of mobility, and the ammo capacity is still as limited as its predecessors (16 for top gun). Slowest traverse available in-game (Tied with GW Tiger)! If your crew is 100% and you have the 203mm gun, the game is really enjoyable. Unfortunately before then, it is awful. Top gun and top radio carry over from the S-51 and SU-14-1 - mount immediately! Engines carry over from the SU-14-1. If coming from the S-51, you should research it for more mobility. 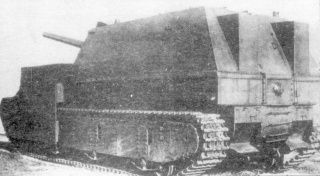 The experimental SU-14 was built in 1934 (possibly 2 were built) as heavy self-propelled guns for mechanized units for the destruction of strengthened fortifications. Specifications: weight- 48,5 t; crew- 7 men; armament- 203mm howitzer B-4 mod. 1931 (range of fire 18 km with 100 kg shell, rate of fire 1 shot/5.7 min) + 3 x 7,62mm MG;- ammunition 8 shells + 2268 MG shells; armor 10-20 mm; engine M-17 500 hp; speed- 27.3 km/h; range 100-120 km. 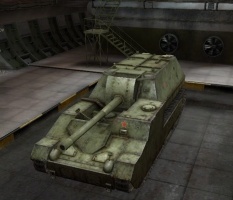 The SU-14 was based on the T-35 chassis with other elements from both the T-28 and T-35. The engine was located in the front and the howitzer was openly-mounted. The original SU-14 had the 203mm B-4. 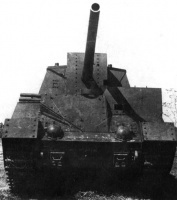 The SU-14 was equipped with two 200 kg cranes for use with the ammunition, two spades, and had to have its suspension disconnected during firing; it could fire only from the stationary position. Its maneuverability and speed were satisfactory. Also, operation of the howitzer was convenient. But, its size was large, armor was insufficient, and it had problems with over-driven transmissions. The SU-14 was tested in 1935 and its engine and transmission were modified (improved SU-14-1 was built in 1936 - it had better and more reliable transmission, improved spades, more powerful engine M-17F 680 hp.). On both SPGs, the 203mm howitzer was replaced by the 152.4mm naval gun B-30 and Br-2 (which had better range and rate of fire) in 1936. 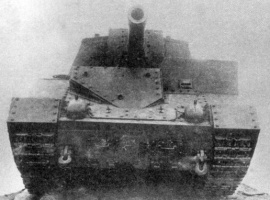 It was planned to produce 5 copies with the 152.4mm gun Br-2 (SU-14-2), but that plan was rejected due to the arrest of the chief engineers of the project. See left most (or top most) blueprint below. In 1936, the new experimental self propelled gun SU-14-1 was built and tested. 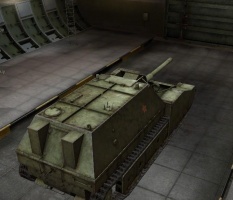 It was the improved version of the SU-14 with the transmission from a T-35 heavy tank (not from T-28 medium tank as in the case of SU-14), more powerful engine, modernized spades, and without the ineffective suspension needing to be disconnected during firing. An additional artillery tractor, “Comintern”, was used as ammunition carrier (50-60 shells) for the SU-14-1. See right most (or bottom most) blueprint above. In 1936, the 203mm howitzer was also replaced by the 152.4mm gun Br-2 mod.1935 with better range and rate of fire. The SU-14-1 was equipped with a radio station and additional armor in 1940 for use during the Winter War against Finnish fortifications (Mannerheim line) from a short distance. 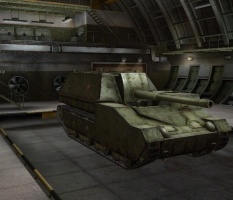 That SP gun was renamed the SU-14-Br2 and was the predecessor of heavy SP guns of the WWII period. Now, the SU-14-2 is preserved at the Russian tank museum (Kubinka). The SU-14 was used quite successful in the destruction of Finnish fortifications during the Winter War. In April 1940, the SU-14 and SU-14-1 were going through tests in NIAP, and in July, were in P.F. Lebedev's tank group in the Keiv Region. In September 1940, both units were given to NIBT for storage. In the fall of 1941, when defending Moscow, both SU-14s and an experienced SU T-100-U in a unit called "Separate Heavy Division for Special Purposes" were used in the Kubinka Region to fire from protected positions at advancing German forces (likely, they were using any working weapon available). SU-14-1 -- Armed with 203mm howitzer B-4 mod. 1931 + 4 x 7,62mm MGs; ammunition 8 shells + 2196 MG shells; armor 6-20 mm; engine M-17F 700 (850?) hp; speed 30-35 km/h; range 120-150 km. SU-14-Br2 -- Armed with 152.4mm gun + 4 x 7,62mm MG; ammunition 16 shells + 2655 MG shells; armor 20-50 mm; speed 15 km/h; range 100 km. SU-14-2 -- SU-14-1 with the radio station. The variant descriptions and the pictures don't exactly match (they came from 2 different sources). It is relatively clear that only 3 vehicles were produced. 2 were likely the SU-14 with the 203mm and 1 was the SU-14-1 with the 203mm. Later, the 203mm gun was replaced with the 152.4mm gun. However, from the 3 pictures directly above, we get some discrepancies. One picture (1st in the row of 3 above) shows the front view of an SU-14 with both armor AND the short 203mm gun. This does not have a variant name. Likewise, the 3rd picture in the group of 3 shows the original plating between the tracks (you can see where it extends to cover the drive wheels and has rectangular holes instead of circular ones). 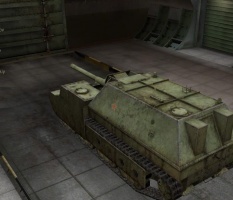 From the the blueprints, this is an SU-14 and not the SU-14-1 modified to an SU-14-Br2. I'm assuming that the armor was tacked on to one (or more likely both) of the original SU-14 prototypes, but they left the 203mm howitzer in. Possibly, this was done so they could participate in the Winter War.